North Jersey Garage Doors offers a variety of garage doors and openers. The newest excitement in the garage door industry is the elegant, classic look of Carriage House Doors without the expense of building and finishing a custom wood door. General Doors is proud to offer their newest doors in a variety of designs that will create the perfect look for any home. Check out their Carriage House line of stamped steel doors built in hollow pan, insulated pan, and sandwich type construction. For the ultimate in customization and curb appeal, they also offer a full line of custom and semi-custom wood Carriage House Doors. Click on their Carriage House link above or give us a call to see and learn more. You'll be amazed at how the right door design and some inexpensive decorative hardware can change the appearance of any home. 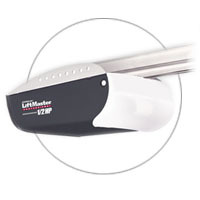 LiftMaster garage door openers are available with a variety of horsepower systems as well as an assortment of features and accessories. Their belt drive systems offer the ultimate in reliability and quiet performance, while their chain drive openers are rugged, reliable and their most popular drive system ever. LiftMaster screw drive systems are sleek and powerful, providing both performance and lifting power. Whether you choose a belt, chain or screw drive opener, you can be confident that it is produced with precision and backed by the world's largest manufacturer of garage door openers. To find out which LiftMaster product is right for you, click on one of the links above to visit the manufacturer's site. With your personality in mind, Amarr offers a total of 300+ residential garage door designs to fit your style and complement your home. Our residential garage doors are available in 3 different materials and 3 different constructions for increasing levels of energy efficiency. Artisan is a full-service manufacturer of fine, custom overhead doors. The handcrafted beauty of their carriage house doors makes each one a delightful testament to Artisan’s commitment to quality of design and workmanship. The blending of technology and convenience with style and craftsmanship allows any installation to be transformed from the ordinary to the exceptional. Artisan's collections include premium choice woods, pleasing details, incredible value, and affordability. To view the many Artisan products or to download an AutoCAD drawing, please click on the link above.